Pitchers and catchers report to Spring Training in three days, but obviously some Chicago Cubs have already long been in Mesa, Arizona, getting ready for the season ahead. 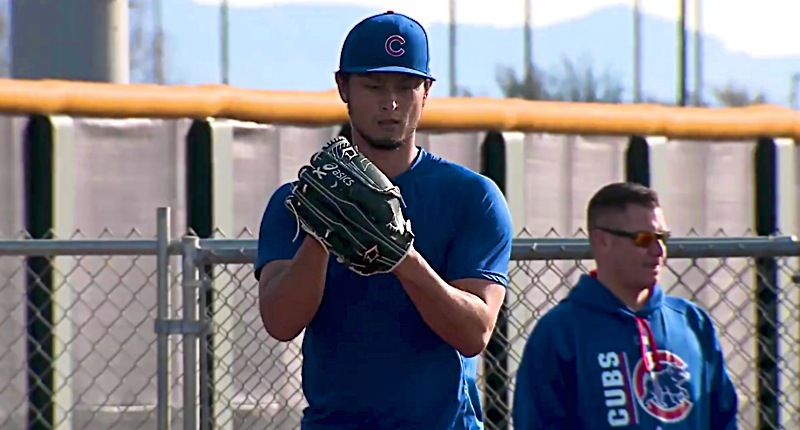 One such Cub is Yu Darvish, who missed almost all of his debut season with the Cubs in 2018 thanks to a triceps injury, a stress reaction in his elbow, and then ultimately a clean-up procedure. As Darvish’s recovery and ramp up continue to go smoothly, it becomes just a touch more reasonable to dream on how good he could be for the Cubs this year, having had so much time off, and perhaps having saved some bullets (a bigger deal for a guy like Darvish, who threw so many competitive innings from a very young age). So far, things have looked very good for a guy that has reportedly added 15 pounds of muscle, and has already been throwing off the mound for two weeks. The Cubs have such a high-variance rotation right now, and Darvish might be the highest variance member. If he’s healthy and strong and pitching to his capability, the Cubs have an ace. A dominant, nasty ace. If he’s a lesser version of himself or injured again, then they might get nothing at all. I’m ready to see the first guy. Previous PostPrevious post:MLB Is Reportedly Considering a Cubs/Cardinals Series in London!